The hospital will feature dedicated imaging centers, 15 operating rooms to perform open heart and other major surgeries (including robotic and orthopedic), a 26-bed birthing center, 14 NICU/continuing care beds, a cancer treatment center with two linear accelerators, a breast imaging center, and a 28-station emergency center. 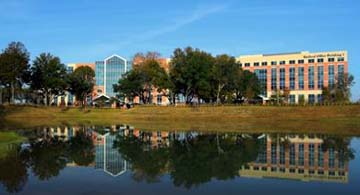 Profile: Touted as the largest outpatient center in the country and located on a beautifully landscaped 42-acre campus on Interstate 10 near Barker-Cypress, the new hospital provides the Methodist Hospital System with a strong, visible presence in the West Houston-Katy corridor. The Methodist campus will initially include a 474,000 SF hospital, a 162,000 SF medical office building, a 13,000 SF central utility plant, ponds with water features, and multiple courtyards and gardens. It was the desire of the Hospital System that the project provide flexibility for the introduction of future modalities of care, as they develop. Services: DataCom Design Group was selected to provided the design and integration of all low voltage systems including audiovisual, security, CATV, wireless, RFID, and Nurse Call/Code Blue. Adhering to the 'fast track' schedule of the project, DataCom Design consultants successfully delivered a technology platform allowing for maximum flexibility, growth, and compatibility.